Sometimes it is desirable to get just the text content out of a PDF-file file. This can be accompliched in various ways. This small utility is one of those ways. Use it this way: If a password is required – either owner or user password – enter it in the appropriate field, then click Convert. 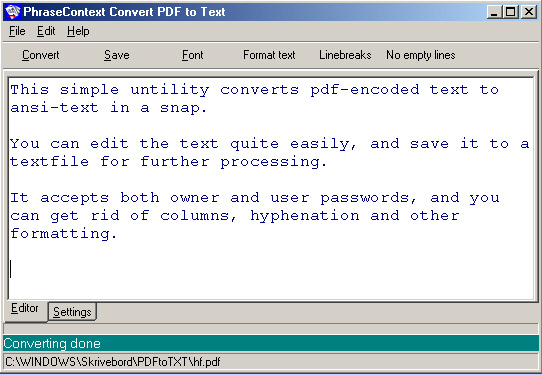 An ordinary open-dialog comes up, so choose the file you want to convert, and in a short while the editor will show the text content of the file. If the conversion fails the program will try to figure out what went wrong.